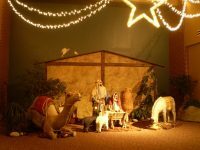 I had the idea to do a life-size interactive Nativity late in 2009, though it seemed an overwhelming job at the time. I’m not a trained artist (though definitely an artist at heart!) and really had no idea how to even start. In early spring, 2011, I felt God nudging me again and I began to think about how such a project could be done. I decided that paper mache would be the way to go, since it is easily manipulated and inexpensive – always a consideration when you’re working on a non-funded project! 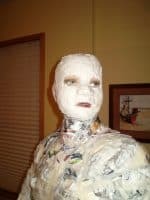 I found this website as I was researching ideas online and came across the guest blog about making a life-size person with chicken wire forms filled with plaster of paris. Then I was REALLY overwhelmed! Thinking of making several people starting from scratch-oh dear! 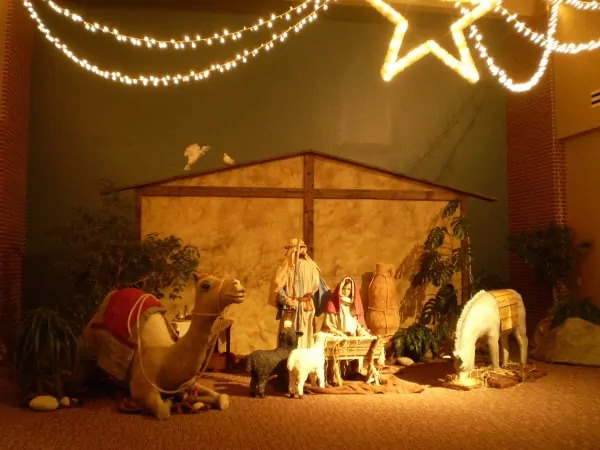 But the tutorial about the baby elephant intrigued me and so began the process that ended with a full-size Nativity complete with a life-size camel (‘naam’ which means ‘hump’ in Arabic), two sheep, two doves, a donkey and a water pot, all made from paper mache. 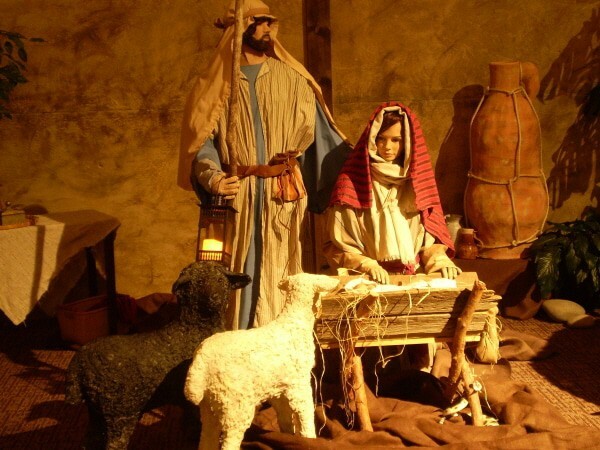 The Lord graciously helped me find 2 mannequins, which we transformed into Mary and Joseph. Since both were female mannequins, it was an interesting transformation to use Jonni’s mache-clay to widen -˜Josephina’s face with a manly square jaw, larger nose and thicker neck. Enlisting the help of a good friend (who IS a trained artist), we embarked on the camel-making adventure. My friend made a pattern by projecting a camel picture onto the wall and tracing it off. 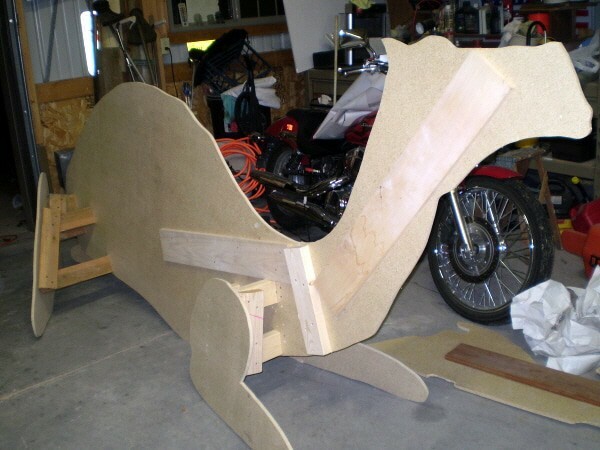 Her husband cut it out, reinforced the seam (since she was longer than a piece of plywood), and fashioned her kneeling legs at the correct angles. Originally I’d wanted a standing camel, but was talked out of it for fear of safety issues with the potential of it falling over on small (or large) children. We tried very hard to make everything as sturdy as possible since I knew that inviting people to walk around and touch the sculptures would lead to some climbing on them (thought we expressly asked them not to do that!). Except for a few scratches and cracks, the entire scene fared quite well during the 6 weeks it was on display. All the animals (except the doves) started out with a wooden armature as Jonni did with her elephant. We then used wads of newspaper and masking tape to form the legs, body and head with appropriate muscles and facial details. On the donkey and camel we used chicken wire around their midsections to hold the paper wads. 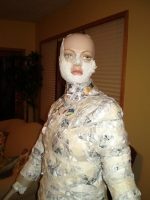 We also stuffed plastic bags with paper wads and stapled them onto the legs and neck since that surface area was so great and taping the large areas was impractical. Once the shapes were defined, however, we did mostly cover them with masking tape to provide the water barrier needed to begin mache-ing. We the used paper strips dipped in flour/water mixture to cover the masked sculptures, allowing it dry between layers. Because I was concerned about making them sturdy, I decided to add a layer or two of mache-clay over the strips. I lost track of how much clay I made and used, but it was several gallons. It provided a very nice outer surface on which to paint. 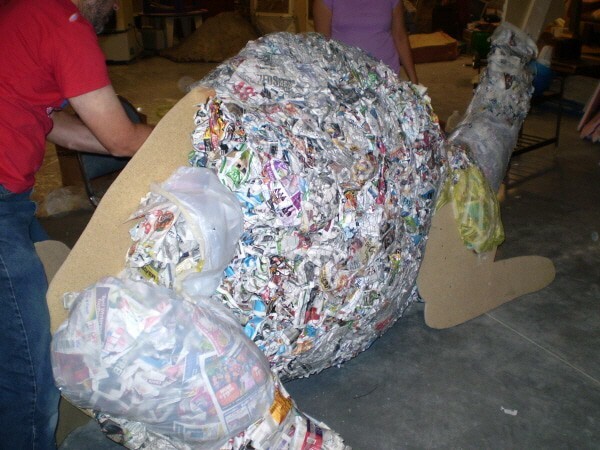 The camel’s eyes are a bouncy ball cut in half, which was painted and glazed. People were so intrigued with the eyes that they poked at them to see what they were made of and the paint cracked! I re-painted once, but it kept happening, so we just left it cracked. I think we would have used something else if we’d known! Her eyelashes came from the back of Joseph’s wig, cut and meticulously arranged in small bunches and glued on, then dry brushed with light paint to match her head hair. Her forelock hair is twine or small rope, unraveled and glued in small bunches on the top of her head. Both camel and donkey tails were made from unraveled pieces of rope. Originally I had wanted the sheep to be soft so the children would enjoy touching them, but soon realized they were going to look like stuffed animals if we used fabric or faux fur to cover them. We tried several different techniques before deciding on paper towels dipped in the flour/water mixture then scrunched onto the sheep bodies to make their wool. I added blobs of clay here and there so their wool coat didn’t look like flower rosettes. The surface was not touch-friendly (read: prickly! ), but in the end, that may have saved them from being damaged. The water pot was two baskets glued and taped together, then covered with paper wads and tape. I wasn’t happy with the shape after the first phase, so added the two extra bumps on the upper and lower edges before covering it with mache-clay, then paint. 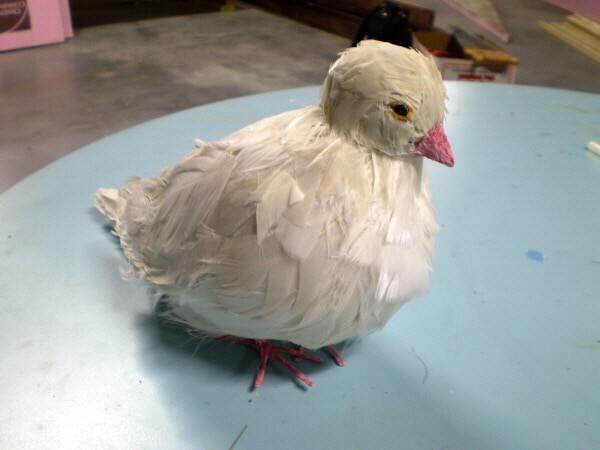 The doves started as wads of paper with cardboard beaks, tails and wings. I formed the feet out of floral wire then taped and mache-ed them. My friend patiently cut chicken feathers apart and applied them one at a time. I, on the other hand, was making the flying dove and wasn’t quite so meticulous. My dove ended up looking like a startled chicken! With a little help from my artist friend, it was tamed down, given bead eyes instead of painted ones and looked more like a dove than a chicken (though if I were to do it over, I would try to find dove feathers instead of using chicken ones). A week and a half before installation, I decided we just HAD to have a donkey so he was made rather quickly (the camel took about 5 weeks start to finish). In my haste I painted him a lovely gray, but failed to notice it was semi-gloss paint! He looked like a carousel horse. New paint in a matte finish rescued him from the carnival! His mane consists of bristles from 3 inexpensive brooms. The color matched perfectly, a blessing considering it was nearly time to do the installation. From the first sheep to installation day it took about 5 months and the help of over 30 people to finish. It was a very fun and labor-intensive project. A big thanks to Jonni for her wonderful elephant tutorial which was just what I needed to kick-start this project. Hi Joni, I’ve learned so much from your site. Tell me, how do we get the pattern for the life-sized camel? Hi Julie. The camel was made by Ann Halim, a guest poster. This is a fairly old post, and I don’t know if she’s still following the comments. I suspect that you’ll need to create your own pattern. I go through the process of making a pattern of an owl here. A camel would be more complicated, but if you find good reference photos of camels where the photo is taken from the side, you can make a pattern. Wow how creative. I wish I knew where to go to be taught how to learn that skill.